AB faces first net session in 5 months! 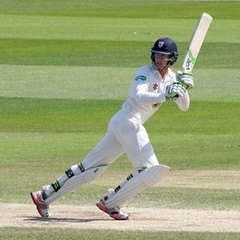 Mumbai - Batsman Keaton Jennings will make his Test debut against India on Thursday, becoming the latest South Africa-born cricketer to pull on an England jersey, captain Alastair Cook announced. "Yeah he is going to play. He's going to open the batting. It will be a very special day for him tomorrow," Cook said in Mumbai on Wednesday before the start of the fourth Test. Jennings, who was born in Johannesburg and captained the Proteas under-19s, was a late call-up for England's two remaining must-win matches after opener Haseeb Hameed injured his hand during the third Test. Cook said he was impressed by what he had seen of Jennings since the tall left-hander joined up with the squad in Dubai a few days ago. "I'd never met him properly. He seems a really good guy. He's got a great head on his shoulders and mentally I think he’s a very strong player so I wish him all the best," said Cook. Jennings, whose mother is English, moved to England in 2011 after leaving school, committing himself to four years there so he could become eligible to play for the national side. The left-hander, whose father Ray played for South Africa during the apartheid era, decided to switch allegiance to further his international career in a similar move to Kevin Pietersen in the early 2000s. Other recent England players to be born in South Africa include Cook's predecessor as captain Andrew Strauss and the former wicketkeeper Matt Prior. Players who were born abroad are eligible to play for England after spending four years playing English county cricket, a policy that has attracted controversy in some quarters. Cook said 19-year-old Hameed's injury was disappointing considering his impressive displays during the tour but urged Jennings, who plays domestic cricket for Durham, to grab his opportunity with both hands. "If Keats (Jennings) comes in and does well again then it's only adding to our top order players, which would be good," the skipper told reporters. England trail 2-0 in the five-match series after a thumping eight-wicket loss in Mohali at the end of November. Anything less than a victory in Mumbai would see India seal the Test series. Cook said it was "50/50" whether fast bowler Stuart Broad would recover from a strained tendon in time. With nothing to lose, his side intended to bat more aggressively, he said. The captain, who recently became a father for a second time, also believes England will have reaped the benefits of their few days' rest and relaxation in Dubai coming into the match. "Certainly the guys do feel re-energised. When you have five days off like that on a long tour, mentally and physically I think it's done the players a world of good," he said. "For me personally it was great to see my family. After those three games in three weeks it was a good time to get out and not really worry about cricket and worry about changing nappies."